Daniel Guthrie Morrison (born January 21, 1948) is a former professional baseball umpire who worked in the American League from 1979 to 1999, and throughout both major leagues in 2000 and 2001. He wore uniform number 34 when the AL adopted them for its umpires in 1980 and retained the number when the AL and NL umpiring staffs merged in 2000. Morrison umpired 2,660 major league games in his 23-year career. He umpired in the 1992 World Series, the 1988 Major League Baseball All-Star Game, three American League Championship Series (1989, 1996 and 1999), and two Division Series (1995, 1997, and 2000). Morrison was a minor league umpire in 1979 during the major league umpire strike. He turned down an offer for a major league position during the strike. This earned Morrison respect among major league umpires. Later that season, he ended up in the major leagues anyway; Lou DiMuro was injured and Morrison was called up as his replacement. ^ Swift, E.M. (August 20, 1979). "Odd Man Out On The Diamond". Sports Illustrated. Retrieved November 2, 2012. 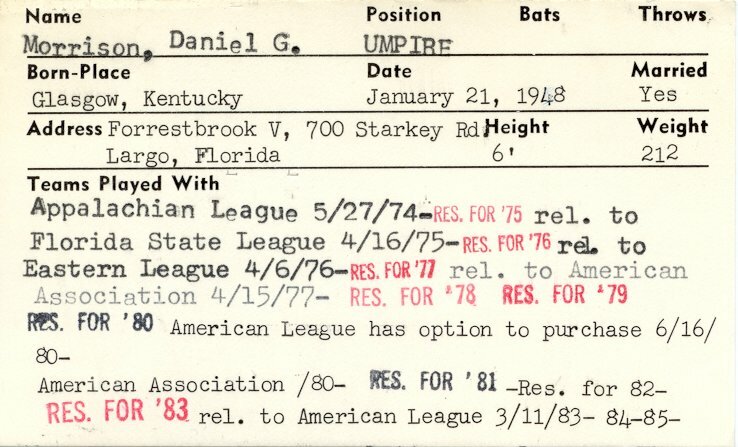 This biographical article relating to an American baseball umpire is a stub. You can help Wikipedia by expanding it.